When a tender heart is needed, we will care for you and your loved one. Newberry’s is dedicated to providing in your hours of need, all the support, compassion and consideration needed to guide you through this journey of grief. 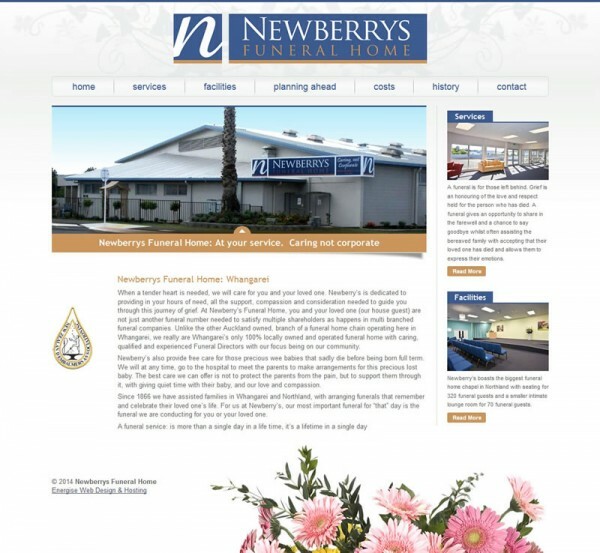 At Newberry’s Funeral Home, you and your loved one (our house guest) are not just another funeral number needed to satisfy multiple shareholders as happens in multi branched funeral companies. Unlike the other Auckland owned, branch of a funeral home chain operating here in Whangarei, we really are Whangarei’s only 100% locally owned and operated funeral home with caring, qualified and experienced Funeral Directors with our focus being on our community. Newberry’s also provide free care for those precious wee babies that sadly die before being born full term. We will at any time, go to the hospital to meet the parents to make arrangements for this precious lost baby. The best care we can offer is not to protect the parents from the pain, but to support them through it, with giving quiet time with their baby, and our love and compassion. Since 1866 we have assisted families in Whangarei and Northland, with arranging funerals that remember and celebrate their loved one’s life. For us at Newberry’s, our most important funeral for “that” day is the funeral we are conducting for you or your loved one.